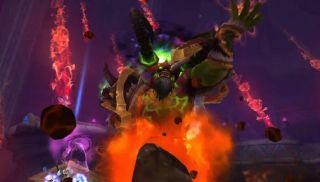 With last night's Warlords of Draenor release date announcement , World of Warcraft fans know when to use up all their remaining holiday days. But what will they be doing as they shirk off the responsibilities of dumb reality? Blizzard's "In Action" trailer gives us a taste, via a brief look at the expansion's new areas, Garrisons, PvP zones and more. If you'd prefer a specific look at just one of those areas, check out this run through of WoD's new Grimrail Depot—a dungeon set on a moving train. Warlords of Draenor will be with us 13 November.